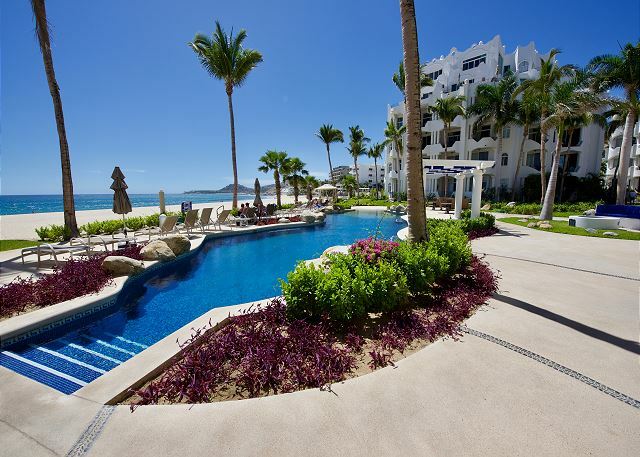 The beachfront pool sits a couple feet from the beach. Mykonos has an 18 and over pool. 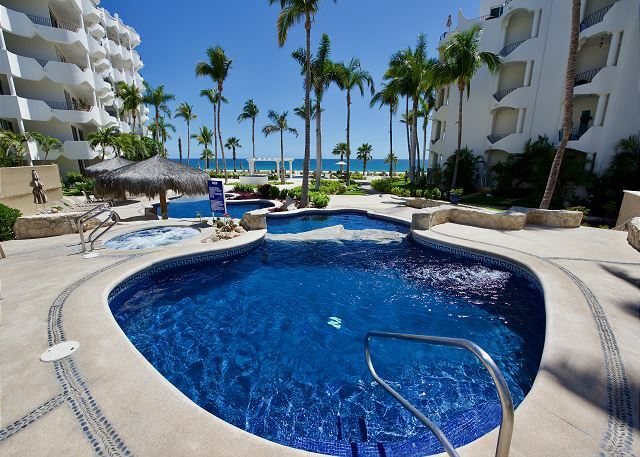 202C is a second floor condo overlooking the pool, beach, and ocean. Mykonos has a poolside BBQ grill and sink. Mykonos has beautifully kept tropical landscaping. Mykonos has many areas to lounge around the pool. Looking at Mykonos from the beach. View of the pool from the terrace. The terrace has a dining table. 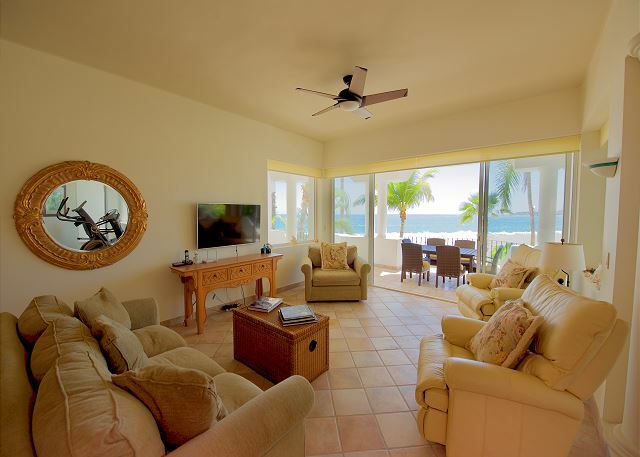 Living room has ocean view and television. Looking into the living room from the terrace. Looking into the living room from the kitchen. 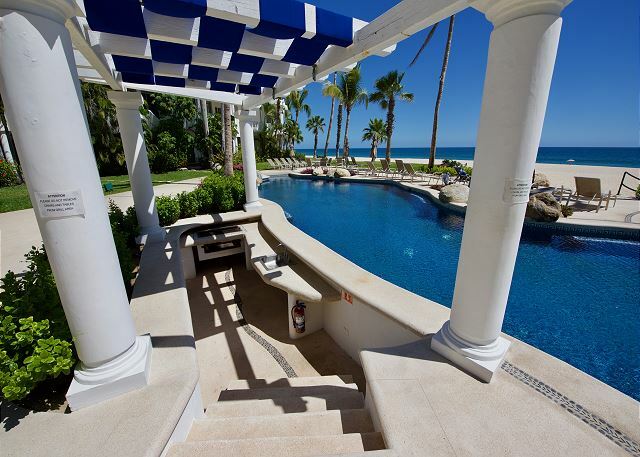 Large terrace overlooking pool and beach. 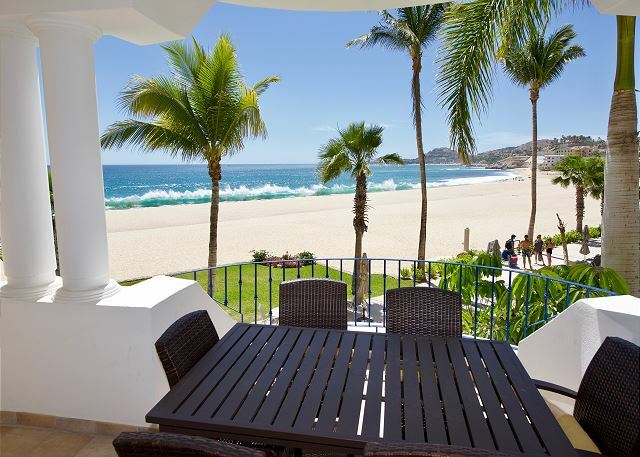 View of the beach all the way to The Palmilla. Entering into the Master bedroom from the living room. Looking into the master bedroom from the terrace. 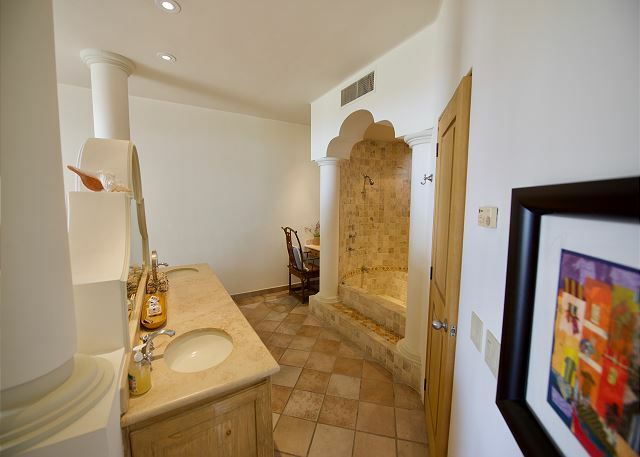 The master bathroom has two sinks, large vanity, and a shower/tub combo. 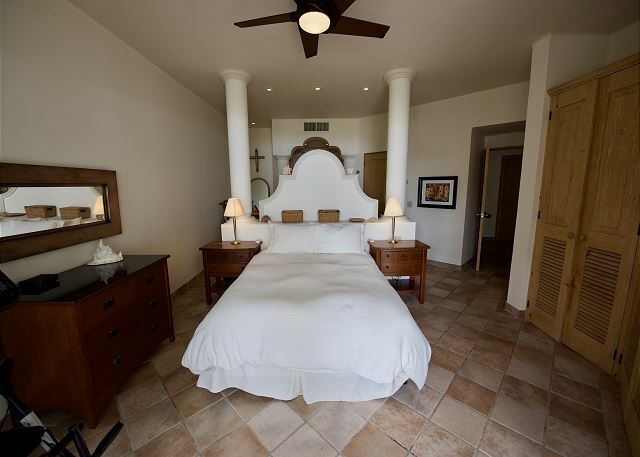 The second master bedroom has a queen size bed. 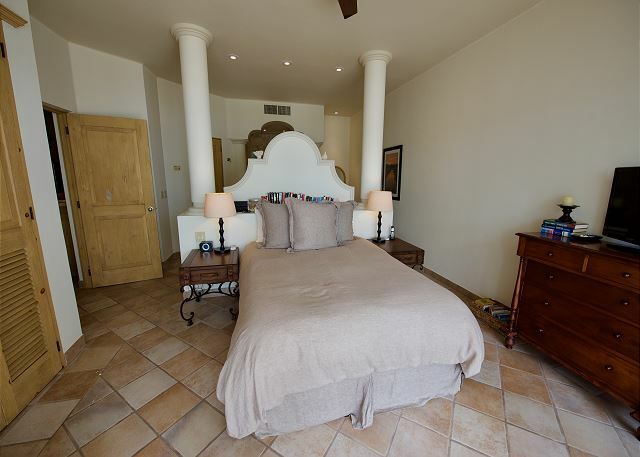 Looking into the second master bedroom from the terrace. 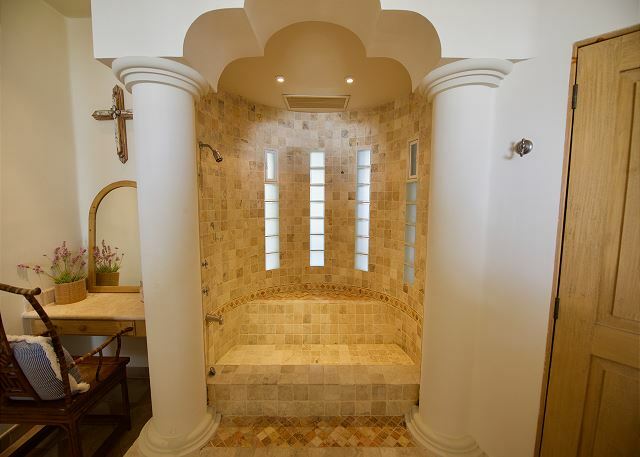 The second master bathroom has a shower/tub combo. 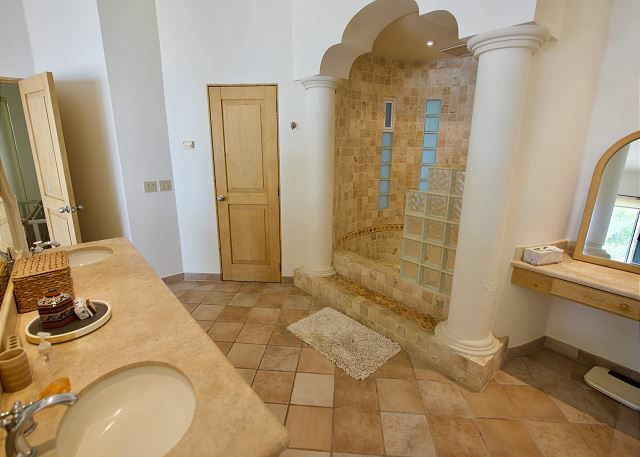 The second master bathroom has two sinks and a large vanity. 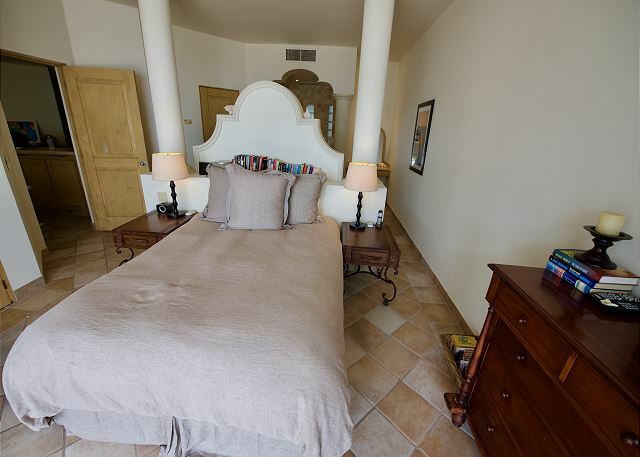 Located on the second floor, this beachfront two master bedroom condo has one of the most amazing views in the Mykonos Bay Resort. 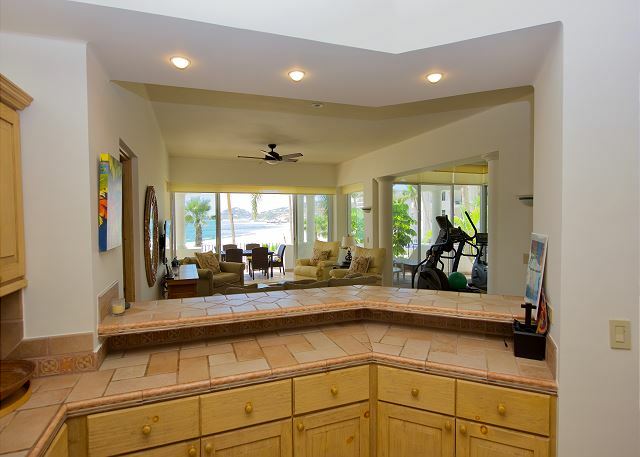 Both bedrooms, the living room, kitchen, and dining room all have unmatched views. 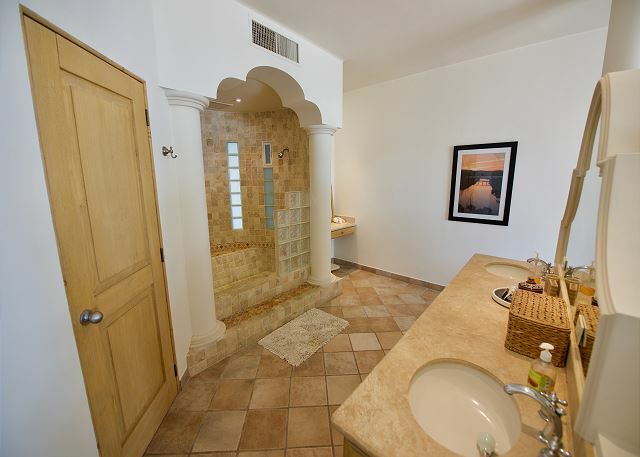 The bedrooms both have private bathrooms with combination shower/bathtubs, and private toilets. 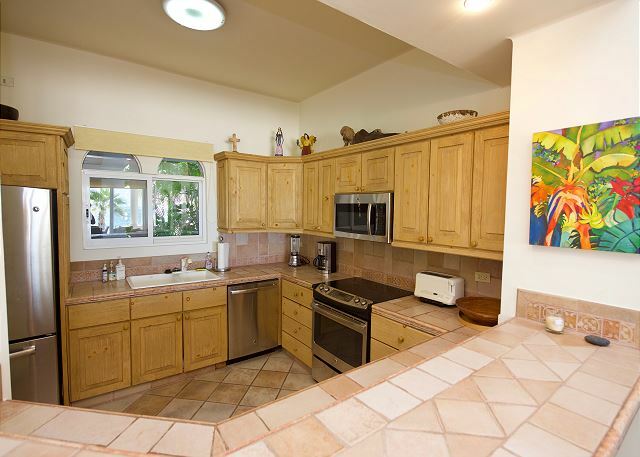 The fully equipped kitchen has all utensils and stainless steel appliances including dishwasher and microwave. 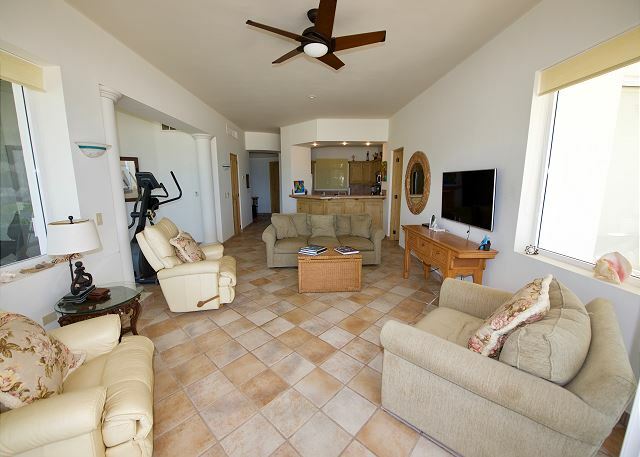 The living room has satellite television and high speed internet. 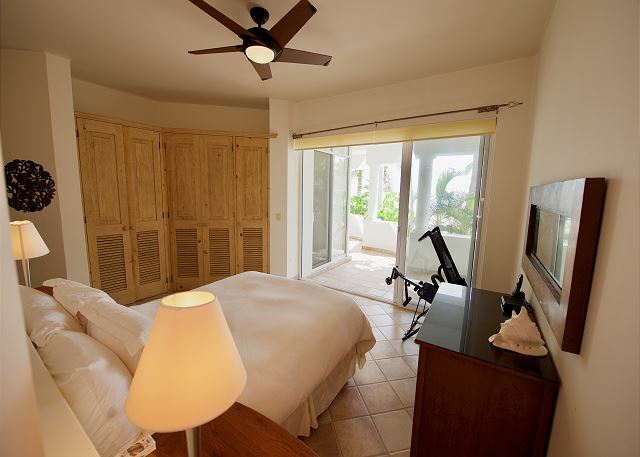 The condo has two elliptical machines for working out in the privacy of your own condo. 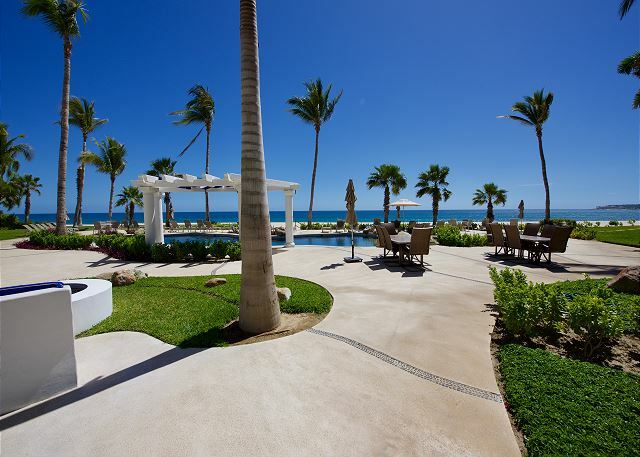 The oversized terrace has a dining table that seats 6 and two lounge chairs. 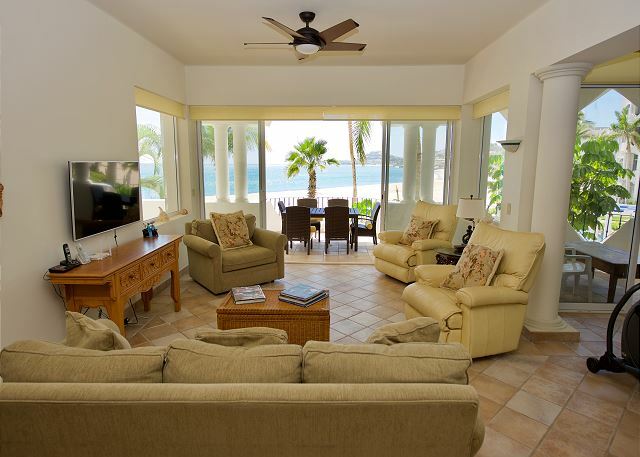 Mykonos Bay Resort has a fully equipped gym and a tennis court located above the garages. 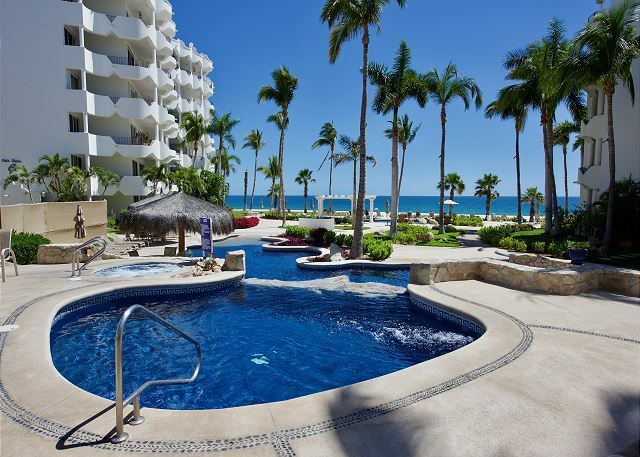 There is also two large pools, one is beach front, a kids wading pool, and an adult only hot tub. 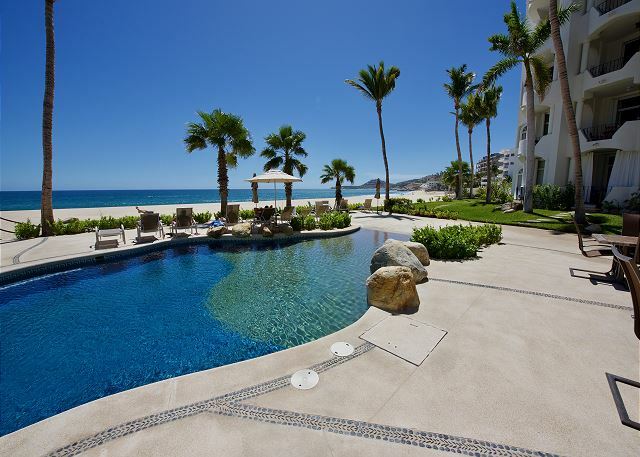 Mykonos has a great location on the beach and is only 20 minutes from the airport, 20 minutes from Cabo San Lucas, and 5 minutes from downtown San Jose del Cabo. 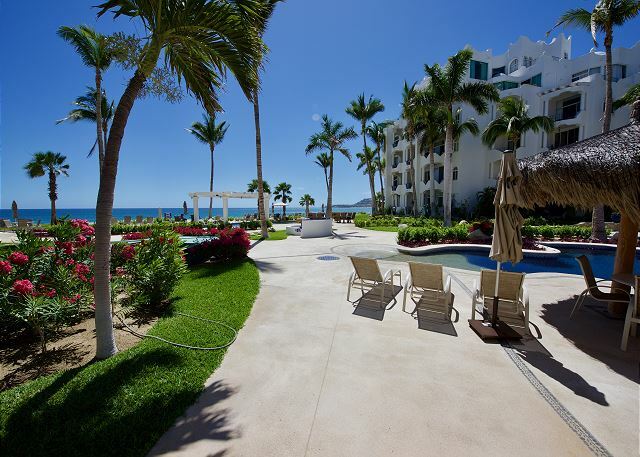 Grocery stores, restaurants, and bars all located close to the condo. 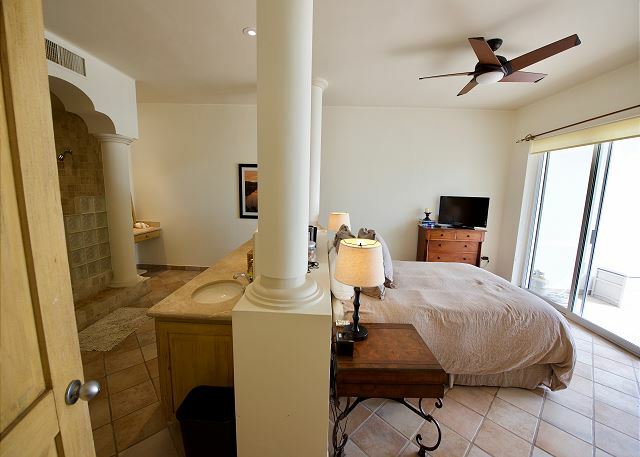 Rooms Sleeps 4, Two full size master bedrooms with private shower/bathtubs. 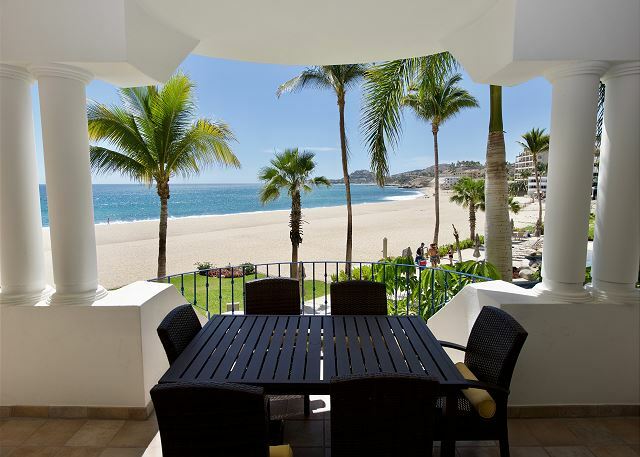 Over the years my family has rented other condos in the area and especially at Mykonos and found that the services we received from Cabos Bound/Mexico Bound Services are superior to any other rental management company. 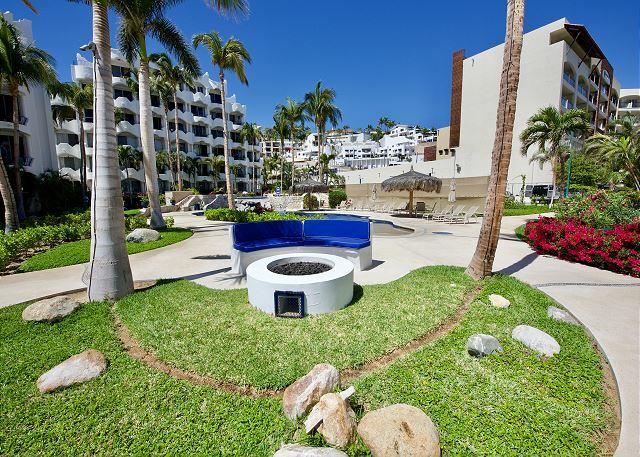 The condo is located in a convenient area and is only 15-20 minutes away from the airport, 7 minute drive from San Jose and about a 20-25 minute drive from Los Cabos. We used both the taxi and bus services that are out your front door. 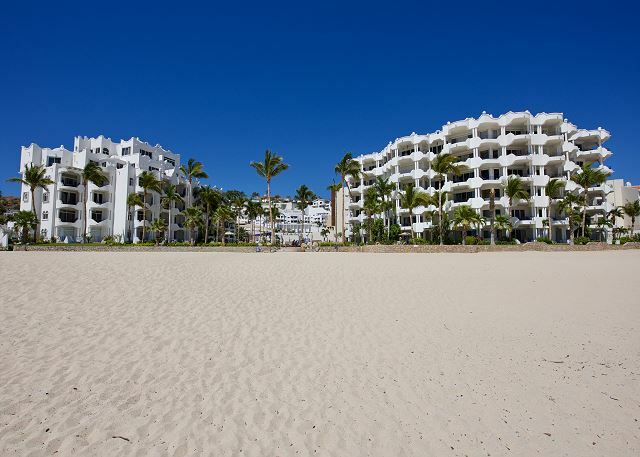 The condo is layout is great for a family or two couples as it has a common area with the bedrooms on each side of it. 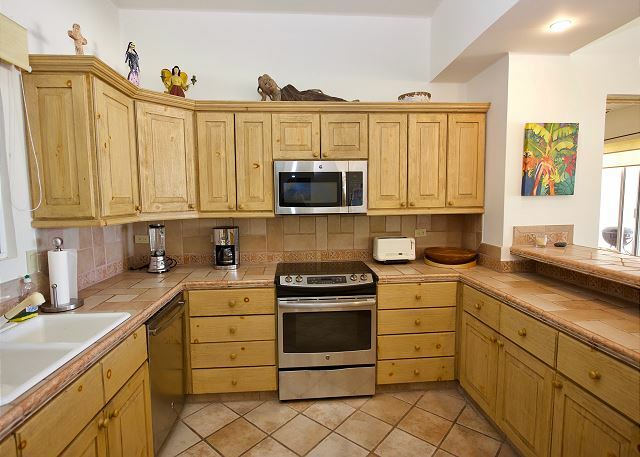 The condo has the amenities of home, clean and is secure. 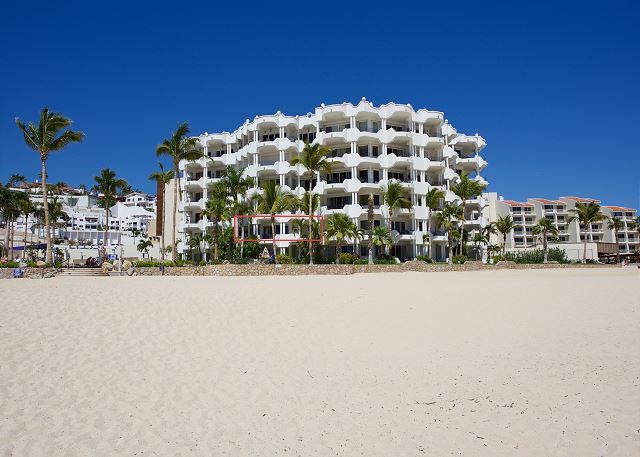 The condo is located on the second with an amazing ocean view. When we did have a question, the responses were quick and taken care of immediately. 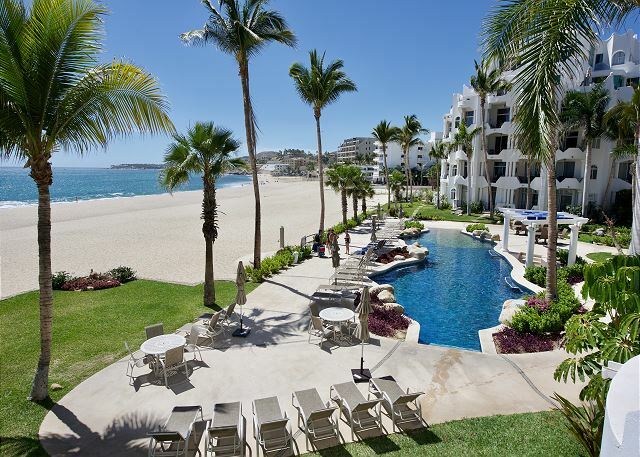 The condo also has a wonderful binder that they put together with places to visit, restaurants, contact information, spanish word reference guide, etc. There are amazing restaurants that are a short beach or highway walk away. Other beaches that are a short drive away to visit are: Buzzard (great restaurant on site), Santa Maria and Chileno beach. We are looking forward to renting this condo again. The staff are very nice, friendly and accomodating. Peter, Heath and Yordy will take great care of you.